The GreenLyte-MV-EXCEL range of laser diode modules provides reliable high power, industrial laser light sources with well-defined line illuminations. Used primarily with industrial cameras, they are suitable for a wide range of inspection, measurement and control systems. Available in visible green with powers up to 50mW, the laser beam output is a uniform intensity line with excellent focus control. Conventional machine vision lasers are adjusted in focus by removing the line optics and inserting a focusing tool into the laser to adjust the position the collimating lens. This process is time consuming and also can result in the laser changing power classification. 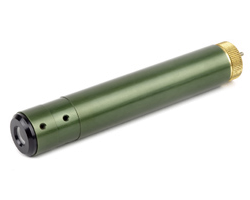 The unique focusing mechanism of the GreenLyte-MV-EXCEL allows the focus to be adjusted without the need for removing line optics by simply rotating the rear end of the laser. This novel design produces improved line quality whilst maintaining accurate alignment. Line lengths from a few mm to several metres are available from a variety of standard optics, with custom optics to suit specialised requirements. A comprehensive range of accessories including mounting clamps and rail systems, mains power supplies and laser safety and enhancement glasses are also available to complement the GreenLyte-MV-EXCEL. Custom power are also available. Please contact us for a custom solution not mentioned in the product documentation.